Sure the minimum wage raises prices, but won’t it just be minuscule? 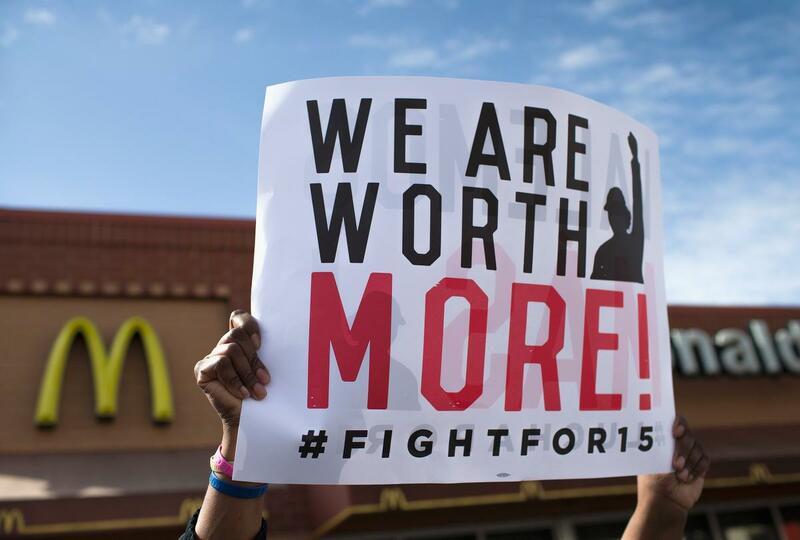 If a $10 an hour minimum wage causes your hamburger to increase by ten cents, who cares? It’s all for a good cause. Plus, those earning the minimum wage will see their incomes rise by a few dollars, so they’re still benefit on net basis, right? If your goal with raising the minimum wage is to help the poor (and it won’t, because 67% of the poor are unemployed), you’re going to hurt those in poverty more than you’re going to help those in the minimum wage. Let’s begin with some estimates. Extrapolating from a study that measured the aggregate effect of price increases on the poor from the minimum wage hike from $4.25 to $5.25 an hour in California in 1996, we can estimate what the net price increase would be from a hike from $7.25 an hour to $10.10 an hour. Both are a similar percentage of increase (21.48% vs. 24.14%). In the aforementioned study, it found that the hike from $4.25 to $5.25 an hour increased expenditures for low income households by $84 a year ($127 in 2017 dollars). Today, there are 47 million people in poverty. Assuming an average household size of 3 per household (the national average is roughly 2.5, but poor households tend to have more persons per household. Having a larger number of children would boost the amount of income one would need to earn to be above the poverty line, for example), so 15.6 million households would be affected. Now, we have to make some adjustments to the study concluding that an increase in the minimum wage from $4.25 an hour to $5.25 an hour would increase expenditures for the poor by $117, as the latter number is inflation adjusted, but the former two are not. In the study (looking at California), the minimum wage was increased from $4.25 to $5.25 in 1996, so 1996 will be our year in adjusting for inflation. $1 in 1996 is $1.55 today. Thus, it’s a $1.51 increase in the minimum wage equals a $117 in expenditures for poor families. And from that, a $0.01 increase in the minimum wage causes a $0.75 increase in expenditure for the average poor household. An increase in the minimum wage would be a hike from $7.25 to $10.10 would be a $2.85 increase. That would amount to a $213.75 increase, or $3.334 billion on aggregate amount all poor households. But how much would the minimum wage put into the pockets of the poor? The CBO’s study on the effects of a $10.10 minimum wage concluded that it would put $5 billion in the pockets of those below the poverty threshold. So right now it seems to be a slight net positive, depending on what kind of poor person you are: delivering $5 billion in benefits for the poor (who work) while imposing a cost of $3.33 billion on all poor people (67% of which do not work). However, that CBO study also found that a $10.10 minimum wage would result in between 500,000 and 1 million job losses. Assuming they previously worked at the minimum wage of $7.25 (when in reality they worked between $7.25-$10.09), and worked 30 hours a week, that would mean that between 5.437 billion and $10.87 billion in purchasing power per year would be removed from the economy. In total, that’s between $8.771 billion-$14.204 billion in costs for $5 billion in benefit towards the poor. Pingback: Nejednakost nije tema kojom se treba zamarati | Tko je John Galt?